Learn how to play recorded programs from your Shaw Direct receiver, as well as understand the various functions of the Playback bar. Pressing PAUSE will pause playback at the current position. Press PAUSE or PLAY to resume playback. Use REWIND and FAST FORWARD to move backwards or forward through the recording. There are three fast forward and rewind speeds available, press the button again to move to the next speed. You can play back your recordings in slow motion by pressing PAUSE and then REWIND or FAST FORWARD. There are 2 slow motion speeds available, press the button again to move to the next speed. Pressing PLAY will always resume playback when paused or if you are rewinding or fast forwarding. Pressing PLAY while the recording is playing back will display the playback bar, so you can see where you are in the recording. The SKIP BACK and SKIP AHEAD buttons skip 10 seconds back and 30 seconds ahead. These duration can be customized under your “PVR Options” or by pressing OPTIONS, 4, 8, 1. If you want to jump to a specific point in the recording, Absolute Jump allows you to do just that. Use the number keys to enter the point you want to jump to, and then press PLAY to move to that location. For example, pressing 4, 5, PLAY will move you to 45:00 in the program. For ultimate control, use the Absolute Skip feature. Press a number on the remote control, immediately followed by SKIP BACK or SKIP AHEAD to move that number of minutes in the recording. For example, pressing 2, SKIP AHEAD will advance you 2 minutes, perfect for bypassing unwanted sections in your programs. Use the ENTER button to bring up the Info Banner for the current program. The current date and time, as well as information for the program you are watching will be displayed. The Playback Bar is like a map of your recording, telling you exactly where you are and where you can go at any given time. 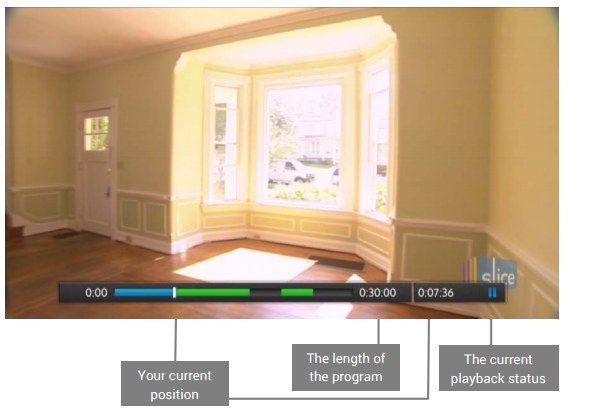 The following diagram explains what each part of the playback bar means: For recordings that are currently in progress, you will see the blank space at the right gradually turn to green as more and more of the program is recorded. If you REWIND or SKIP BACKWARDS into a part that has already been viewed, it will turn green again. You can press ENTER at any time while playing back a recording to view the Info Banner for the Program.